Each text contains a TABE 9&10 Correlation Chart that links each question to targeted skill lessons, enabling instructors and students to build a personalized study plan based on skill level strengths and weaknesses. Each workbook begins with a pre-test and a skills correlation chart to help diagnose strengths and weaknesses and determine TABE readiness. The format of each pre- and post-test matches that of the actual TABE test. 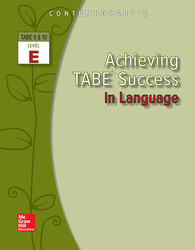 Each lesson specifically targets a TABE skill. Students work with the innovative lesson format that provides step-by-step instruction to help insure success. The Mathematics lessons offer plenty of instruction and practice to help master each TABE skill. Mathematics texts contain a Glossary of Common Terms to help students with the language of math.